My green camisole dress is finished. 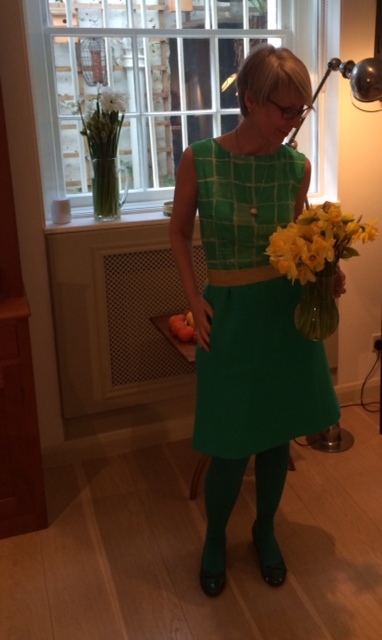 It epitomises spring – especially when worn with a large bunch of daffodils. And a pineapple! I wore this dress for my birthday, with a piece of yellow vintage silk velvet ribbon around my waist. It felt nice and, with our improving weather, suitable for the season. It was not an easy make, despite having done the same skirt with camisole before. The main reason – and I often find this – is that with different fabric the sizing changes – this time by around two inches (which would be a couple of dress sizes, or more), mainly in the length. Even now it is a little looser than the navy one, but I decided to leave it with a little fullness at the waist which can be pulled in with a belt. I ended up taking an inch off the dress above the waist, and three inches off the length (having asked for your opinion and being supported in this course of action – thankyou Jay, Sewniptuck, And others. Sadly I did this after I had put in the zip and hemmed it. So I had quite a lot of unpicking, remarking, cutting, sewing, doing the same with the lining, and then stitching it up again. If the truth be told this dress has had a zip put in four times. I often find I am altering almost finished garments, which is really irritating, but despite my best efforts on fit, different fabrics behave differently (of course!). And if I have made something before, and it fits, I am off-guard – in that my sense of security means I just sew away, assuming that all will be well. I have learnt this lesson more than once but offer it to you now. TNT does not mean automatic pilot. In terms of the SWAP I now have to make a white overblouse, and a hand painted silk dress. I have the rest of the month to achieve this and feel fairly confident. Looks fab. I like the look of the blog with the new logo! My blouse is almost finished, just the button holes to do. I’ll be wearing it later I hope. Looks beautiful! I love the colour! Happy Birthday Kate, I hope you had a wonderful celebration. Looks gorgeous and Happy Birthday! 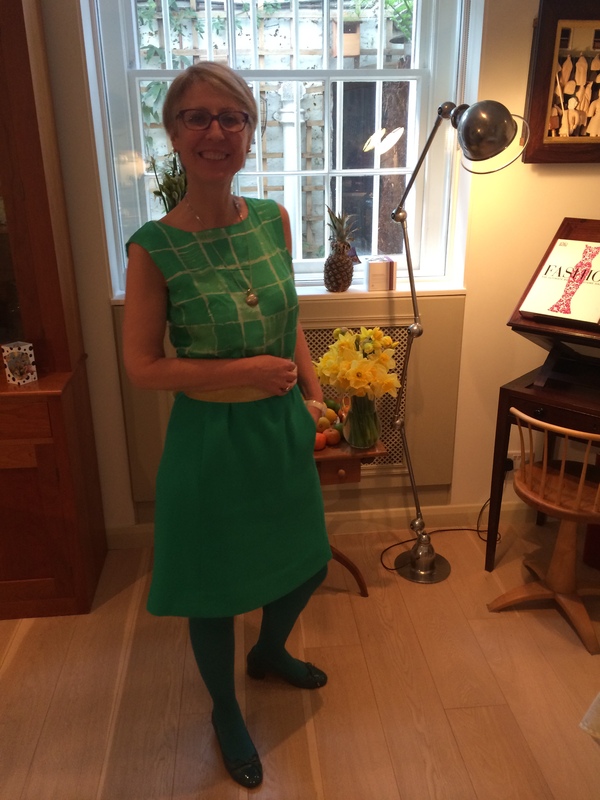 I love the green (with the daffodils and pineapple – perfect composition!) I am also a spring baby, but my birthday is a ways off. K, I’m glad you wrote this, as I was feeling rather sad about my sewing after I finished my recent dress and toiled something else. I am going to post something about the mishap that occurred. Love the greens and yellows and sunny attitude despite having to rip out a zipper and replace it…but 10 green zippers are no bad thing! Hope your birthday was a great one, mine is tomorrow. Oh Happy Birthday dear Mrs Mole – so nice to hear from you! I love this on you Kate. The square design on the silk compliments you, drawing our attention to your lovely square shoulders . I too am guilty of auto piloting a TNT – this sewing lark doesn’t really get any easier in my view. But your new green dress is well worth the effort I reckon. Oh and nice pinked lettering at the top. F-A-B-R-I-C-K-A-T-E-D!